All of us at SCIREQ would like to express our shock and horror at the atrocious events that took place at the Boston Marathon last Monday. Our hearts go out to the victims, their families and all those affected. 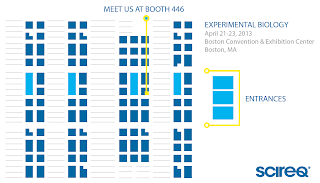 As per the information currently available to us, the exhibit at the Experimental Biology conference is set to proceed as scheduled. Further information can be found on the EB website. The exhibit is located at the Boston Convention and Exhibition Center and is open April 21 to 23 from 9 am to 4 pm. Our SCIREQ team will be happy to welcome you at booth #446. The flexiVent User Group Meeting is scheduled for Wednesday, April 24, at the Westin Copley Plaza hotel. We have confirmed the continued availability and security of this venue with the hotel staff, therefore this meeting will also proceed as scheduled. We understand that the proximity of our venue to the site of the attacks may cause discomfort to some of our attendees. However, after thorough consideration, we feel that the meeting should go ahead at this site as we refuse, whenever possible, to allow such events to change the way we live our lives. We hope that our attendees and clients agree with this choice, and that attendance at the User Group Meeting will be unattenuated. For further information about the User Group Meeting, please refer to this earlier posting. To register, please fill in our online form.